Degenerative disc disease is not really disease but a term used to describe the normal changes in the spine due to age. It happens throughout the whole spine but mostly in the lumbar discs as they have the most pressure on them throughout life. 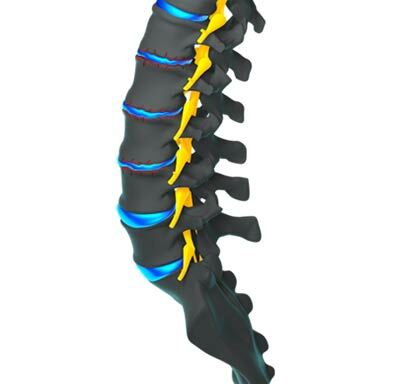 As the space between the vertebrae get smaller and the discs get worn, the spine becomes less stable. The body reacts to this by constructing bony growths called bone spurs (osteophytes). Bone spurs can put pressure on the nerve root and cause pain numbness and tingling in the extremities. People who smoke and those who do heavy physical labor, such as repeated heavy lifting, are more likely to have accelerated disc degeneration. People who are obese are also more likely to be symptomatic. Exercise, weight loss, and quitting smoking are ways to slow down disc degeneration. Surgical intervention would only be considered after extensive conservative care.